Mullaby, North Carolina, is a sleepy town full of the rich scent of barbecue and the sound of closely kept secrets, secrets that glow in the dark and smell of sparkling sugar and vanilla. They float in the woods at night, taunting newcomers and residents alike. Julia Winterson knows these secrets well; one of them is her very own. Returning to her hometown after years away, she must pick up the pieces of her father’s material legacy before she can leave again to begin a life of her own. A dream to own The Blue-Eyed Girl Bakery in far away Baltimore keeps her going as she bakes cake after cake in her father’s restaurant, yearning for a life away from where she is while at the same time wanting to return to a night long ago. A night spent with a boy who is now a man. A man of Mullaby. For whom does she bake these cakes, and what keeps her from leaving it all behind? Is it her past or her future that keeps her in her small hometown? Julia’s neighbor Emily Benedict however has returned to Mullaby in the exact opposite position: She comes knowing nothing at all about the town or its residents and their secrets. After her mother Dulcie’s death, the teenager returns to live with her larger than life Grandfather Vance in an ancient Southern home almost as big as the giant himself—a grand house with a peeling facade and whimsical wallpaper that always seems to suit your mood without fail. There she finds that perhaps her mother was not the woman she believed her to be, and in fact maybe she herself is responsible for righting the wrongs of the past. But should the daughter suffer for the sins of the mother? The answer depends on whom you ask in the small town. And what of the handsome boy in the suit who seems to pull her in like a moth to the flame; will he be her savior or her undoing? Love, hate, and the sweet smell of cake permeate The Girl Who Chased the Moon, making it impossible to resist after just one page. The New York Times best selling author has created another originally amazing world within her newest work, a magical backdrop of love, fancy, and Southern warmth. Her words are like comfort food for the soul, and readers will want to indulge again and again in her offerings. When searching for a Southerner who can spin an enchanting tale, search no further than the Carolina’s own Sarah Addison Allen. 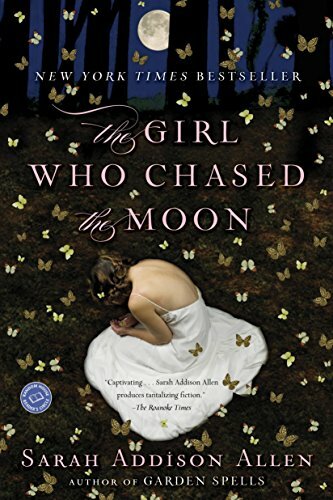 When trying to satisfy your sweet tooth for a good filling read, search no further than The Girl Who Chased the Moon. But don’t be surprised if you awake to flour and sugar having made its mark on the pages because the story will live much longer than it takes to be read.